After receiving intensive training in CT Coronary Angiography at Harefield Hospital, I obtained full accreditation in 2010 (and re-accredited in 2014 & 2017). Initially Colchester Hospital did not have the ability to perform CT Coronary Angiography so I took my patients to the Cardiothoracic Centre in Basildon where I scanned and reported CTs jointly with the Centre’s Radiologists. As Clinical Lead in Cardiology for Colchester Hospital, I was keen to develop the service locally to save patients from the long trip to Basildon. I worked closely with the Radiology department to upgrade our CT Scanner. In early 2012, the scanner was upgraded and we started the service locally, repatriating the work from the Cardiothoracic Centre. 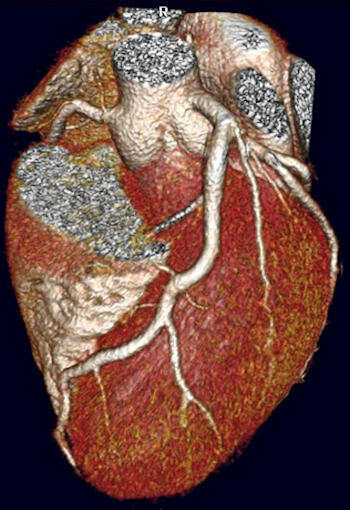 In 2016, the scanner was replaced with the latest Toshiba Aquilion One scanner, which can take a full picture of the heart in one heartbeat. This has greatly improved image quality while substantially reducing the radiation dose. I have continued to work closely with my Radiology colleagues to provide this high quality service. As part of my work integrating cardiac services across Ipswich and Colchester, I now provide CT coronary angiography for Ipswich patients at Colchester Hospital. I give lectures on CT angiography for the joint Essex Cardiothoracic Centre and Bart’s CT Angiography Course.